for information about the image on the cover jacket. chapters for obituaries, bibliographic material, stories and letters for those men for whom these are available. The hardcopy edition will include photographs. An introduction provides local framework, historical context, and a very brief overview of the unit's military career. However, this book is not intended as a military history and should not be considered as such. The focus of the Register is the men who fought for their country, their communities, and their ideals. Around 300 men from Fauquier and surrounding counties served in the Black Horse Cavalry over the course of the war. At any one time, around 80 to 100 men were in active service. MORE ABOUT THE TERRIBLE BLACK HORSE. Alexandria, July 25, 1861. 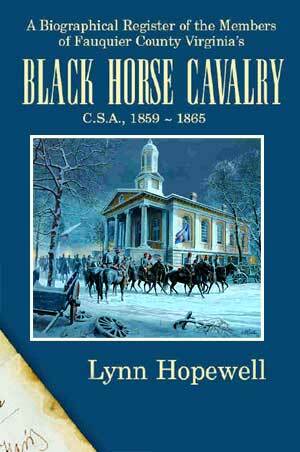 I overheard one of the men sitting on the doorstep of the house describing the charge of the Black Horse Cavalry, part of which, I be­lieve, is Capt. Scott's Fauquier cavalry. He said they advanced in a wedge form, then opened, disclosing a battery which fired upon his regiment, and that then the cavalry charged upon the regiment, hemming it in on all sides; and, cutting right and left with tremendous blows, each blow powerful enough to take off a man's head. He said he never wished to see such a charge again. To the Black Horse Troop. In tender memory of the dead with affectionate greetings to the living. My proudest thought is that I was one of them.